Don't look now, but The Ohio State Buckeyes are playing football, there are brown leaves on the ground and colorful leaves in the trees. Fall is here! Fall brings OSU football with it, but it also brings damaging dead leaves that can attack your assets and cause problems for you on a number of fronts. As a property owner, you should always be thinking about protecting your assets. 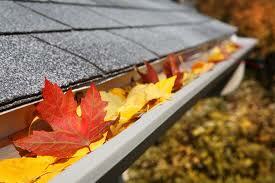 One easy way to protect your roofs, gutters, downspouts, & foundations is to have your gutters cleaned once most of the leaves have fallen. This simple, yet often overlooked preventative maintenance technique can pay huge dividends by preventing just one water intrusion. Keep Your Tenants Off Your Roofs! A large roof, even a roof over a porch or deck, can often entice your tenants to use it as a gathering space. It's not uncommon in Columbus, especially around Ohio State's campus, to see numerous people hanging out on their roofs. This includes laying out to sunbathe as well as general gathering. More often than not, alcohol is involved. This is obviously a safety issue, and likely one that is clearly prohibited by your lease agreement. If not, you'll want to add a clause prohibiting anyone from using any space not specifically designed for gathering. For example, some roofs have decking and handrails as they are specifically made to be. Whether you own 1 rental property or one hundred, ensuring you can enter your units when you need to is crucial. As you start buying investment rental real estate, it's easy to simply keep each home on a separate lock system, categorizing the keys and changing out the locks as needed. However, as you grow, or if you're a fan of being efficient, you'll want a simpler solution. We recommend a master lock system for all of our Columbus clients. While we can install virtually any lock the landlord chooses, we can also recommend a system tailored to fit your exact needs and budget. Don't wait until you have.